Combining great drinks with a cruise on the water? What gets better than that? Next time that perfect warm day rolls around and you want to hit the water with a glass of your favorite craft beer, wine, or cocktail, we’ve got you covered. 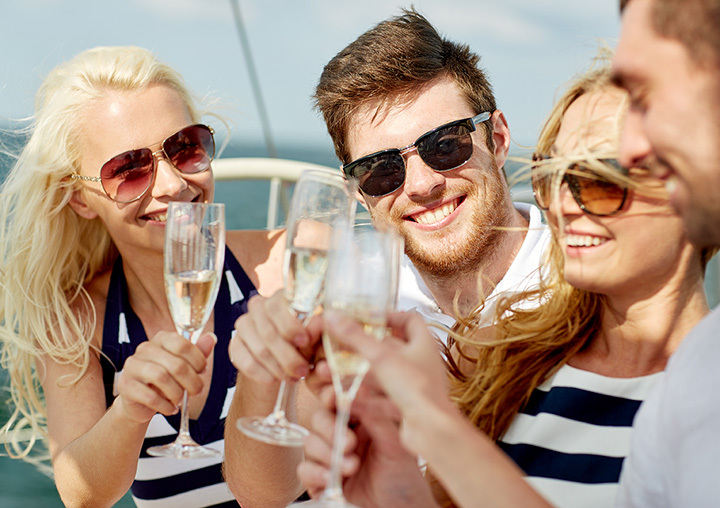 All aboard the best booze cruises in Wisconsin! The Riverwalk Boat Tours in Milwaukee offer the perfect selection for booze cruises. If you are looking for themed public parties or looking to book out a private event—they do it all. They’ll help you get through the week with Margarita Monday cruises, Tiki Tuesday Cruises, Thirsty Thursday Cruises, and wrap it all up on Saturday for their signature Social Saturday Cruise. Newly added to the Peddle Tavern this summer is the Paddle Tavern! They can fit up to 14 people on a boat as you set sail for over an hour and a half of water fun. Bring your own drinks and let Paddle Tavern do the driving. You’ll even stop at a few river bars for added fun! Set sail with Betty Lou Cruises April through October. Their motoryachts are the perfect way to spice up girls’ night. Choose between a private, public charter, or their special public cruises. Plus find all the local libations aboard Betty Lou. Enjoy public cruises with themed dinners or peacefully watch the sunset while eating for favorite surf ‘n turf fare. There are tons of public cruises offered by Edelweiss Boat Tours that your group will love. Their beautiful vessels take on Lake Michigan while you get to sit back and enjoy the views and your drink. The chain of lakes located in Minocqua, Wisconsin, are the perfect place to have a fun filled booze cruise. You’ll visit Lake Minocqua, Lake Kawaguesaga, and Lake Tomahawk. It’s BYOB, but coolers, water, sun screen, and fun are all included in the package! While the Dirty Turtle is a local establishment in New Lisbon great for food and drinks, they are located on Castle Rock Lake. The Cruisin’ Turtle is their very own rental vessel—perfect for all types of events (especially those including drinking). Book your reservation on the Cruisin’ Turtle this summer! On the Loos Public Cruises are the perfect way to mix up your next event. They offer a full-service bar and catering menu. Sit back and watch the sunset on the Fox River, Lake Butte Des Morts, and back to the Oshkosh Riverwalk. Clear Water Harbor Water Front Restaurant and Bar located in Waupaca also offers boat cruise events. Many of their boat events featuring local brewing companies like New Glarus Beer Tasting and Door Peninsula Wine Cruises are already sold out. Book early and have a great time! The Lake Geneva Cruise Line is a great way to add some extra fun this summer. Choose from smaller group charters or ride along on their famous boat tours. Either way, plan ahead to make sure your party is customized perfectly for you. Choose your vessel, add your choice of food and drink, and even invite local entertainment to keep the party spirits going all night! The Wisconsin River Cruises are a great excuse to get on the river. Their Specialty Cruises are the perfect way to enjoy a couple of drinks while enjoying the great scenery located on the Wisconsin River. Book early—you won’t be disappointed!